The Adrenaline Rush II is huge and fun for all ages. The left and right sides of the inflatable obstacle course begin with log obstacles, a rock climb with slide, and crawl thru tube. The center of the course takes players through pop ups and then to a double climb and slide for a photo finish! 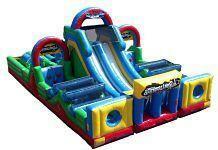 This bright and colorful obstacle course is sure to be a hit at your next event. Click here for a video of the obstacle course.